I have literally got such a back up of recipes just piling up waiting to be posted on the blog – I promise I’ll do my best to try and keep up with it! This recipe I originally created for a feature in Cook Vegan Magazine (now renamed to Plantbased Magazine), alongside two other microwave cake recipes that I might share with you later. Microwave brownies and cakes are perfect for satisfying that cake-y snack craving, without having to spend hours in the kitchen preparing. Oh and also all that mess that suddenly appears in the kitchen when making a cake (at least this is what happens in my kitchen) – totally avoided! As mentioned, this recipe was created a few weeks back… when my microwave was still in working order. Unfortunately it has given up on life since, but tbh I can’t remember a time I used it this year apart from melting butter for other recipes and these mug cakes. Poor Nick though… the microwave was his best friend for heating pre-cooked meals, but he’s gotta do without now. Spoiler Alert: These tasted amazing! In a mug combine all dry ingredients: flour, baking powder, cinnamon, cacao powder and linseeds. Combine the rapeseed oil and 1 Tbsp soy milk in a separate mug, then slowly mix into the dry ingredients. If the mixture becomes too crumbly, simply add up to 1 additional Tbsp of soy milk. 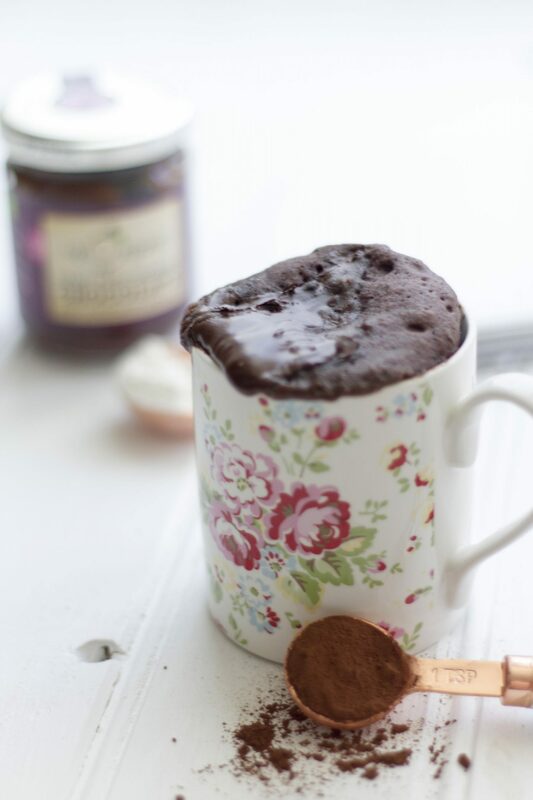 Add a teaspoon of your favourite vegan chocolate spread onto the top before microwaving for 1 – 1 ½ minutes.